We made a video to show what happens every year on the first rain of the season (usually in October or November). We call this storm the “First Flush”. The First Flush pushes the massive amounts of pollutants that accumulates over the year in storm drains, into the Santa Monica Bay. Trash from all across Los Angeles County gathers and sits for months just waiting for the first big storm to push it out into sea and effect the safety of marine life and citizens. 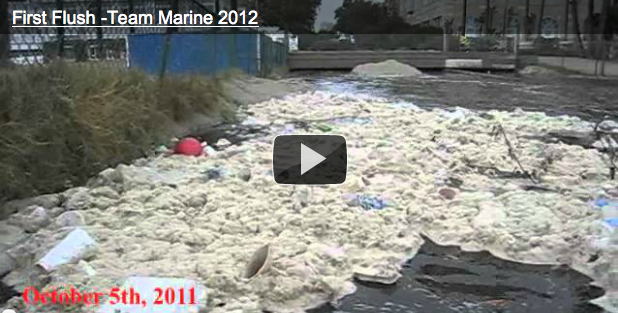 This video from October 2012 documents the different types of trash and “mystery foam” we have found during the First Flush. Previous PostPrevious Bag Team Quikscience Project!